Absolutely amazing. The beam is highly highly visible at night and in dark rooms, I could even track the beam outside in daylight. THE LASER DOES NOT COME FOCUSABLE. It comes focused to "infinity" so it does not burn as well as it could. Go ahead and buy the beam expander with the laser so you can adjust the focus, once you have the beam focused to a point it burns like crazy. The laser is very well made and feels heavy and solid. One downside, the beam is rather rectangular, you can turn the laser and see the shape of the beam change, but it doesn't affect the ability of the laser. 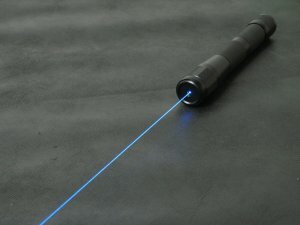 Bottom line, buy the beam expander and it's the best laser available. I purchased a 1W 447nm Spartan, along with a pair of safety goggles, on Feb. 2nd. And through processing and all, it arrived home in about 22 days. From China all the way to LA California. Over all, I'm very satisfied with my purchase of this laser. It burns everything I thought it would and more, and it also burns considerably far should you be able to hold a steady hand. I'm not sure if it puts it 1 watt of power, as I do not have an LPM. But, the beam is very steady, and you always know when the batteries are dead. As the power goes from a crisp beam, and rapidly falls off. So your beam constantly stays strong. Spartan host is very sleek and the black finish on it has yet to wear away, promising a long last on the finish. The only thing I am not satisfied with was the laser goggles. I ordered the LSG02 and expected the stylish looking glasses that the picture shows, but recieved a different style of glasses. Other than this, very satisfied with DL and if I ever have any other laser business, I know who to do it with. in a word "AWESOME" from the AAA+ customer service, the lighting fast mail/delivery[11 days and that was after a email apologizing for the shipping delay, because of a national holiday] and the "torch" totally exceeded all my expectations...when it comes to lasers Dragon is the only name u need to know...wickedlasers are toys compared to these...deploying a Dragon=ear2ear grin...!! !